Set forth below are the Terms and Conditions that are applicable to all submissions. If any of these Terms and Conditions are not acceptable to the person who is contemplating making a submission, then such person should not make a submission. By making a submission, the person doing so (the “Submitter”) confirms that he or she has read the Terms and Conditions, fully understands and accepts them and agrees to be fully and unconditionally bound by them. “Motorhead” means the recording/performing artist known as Motorhead and its successors, assignees and designees. The “Muralist” means the Submitter who is selected to create the Mural. The Submitter must be at least 18 years of age. No materials submitted by the Submitter will be returned to the Submitter. The Muralist will be selected by Motorhead in its sole discretion based upon Motorhead’s judgment of the artistic quality of the Submitter’s portfolio submission and its stylistic appropriateness to the subject matter of the Mural and the overall project. Motorhead’s decision shall be final and binding upon all Submitters. The Muralist irrevocably and forever grants to Motorhead all rights, interests and ownership of every kind throughout the universe in and to the Mural and all elements thereof and all reproductions and derivatives thereof (including, without limitation, sole ownership of the copyrights in the Mural and all elements thereof and all extensions, renewals and revivals thereof). The Mural will be a work- made- for- hire for Motorhead by the Muralist for copyright law purposes, and the Muralist agrees not to make any claims to the contrary. The Muralist waives any so-called rights of “droite morale” or “moral rights of authors” that the Muralist has or may have under any treaty, statute, regulation, or rule of law of any country, whether now existing or hereafter amended or given effect. Motorhead has the right to register the Mural and all elements thereof for copyright (and all extensions, renewals and revivals thereof) in Motorhead’s name as the sole and exclusive copyright proprietor thereof, and to place copyright notices in Motorhead’s name on the Mural (and all reproductions and derivatives thereof) as the exclusive owner thereof. If the Mural or any element thereof is at any time determined not to be a work-made-for-hire, it will be deemed irrevocably and unconditionally assigned and transferred by the Muralist to Motorhead by this agreement, together with all rights in it, perpetually and throughout the world. Motorhead will have the sole and exclusive right in perpetuity throughout the universe to exploit the Mural and all reproductions and derivatives thereof (in whole or in part as Motorhead elects) by any and all means and methods and through any and all media and mediums of exploitation, distribution, publication, reproduction, dissemination, transmittal, broadcast, marketing, promotion, advertising and sale, whether now known or hereafter devised or discovered, for any and all commercial and/or promotional purposes without the Muralist’s consent, approval or permission and without the Muralist being entitled to any payment or compensation, which the Muralist hereby forever and unconditionally waives and relinquishes. The Muralist acknowledges and agrees that the sole consideration which the Muralist may derive from the Mural is whatever promotional and publicity value that creating the Mural may have for the Muralist. In this connection, the Muralist is entitled to sign his or her name in the lower right hand corner of the Mural and the Muralist may include a photograph of the Mural in the Muralist’s promotional portfolio of the Muralist’s work. The Muralist agrees that the design artwork which shall be embodied in the Mural shall be created and owned by Motorhead and that the Muralist’s job will be to faithfully reproduce such design artwork on the Mural to Motorhead’s full satisfaction. In the event that Motorhead wishes the Muralist to change, modify or otherwise alter the Mural, the Muralist will do so until Motorhead is fully satisfied. The Muralist shall not create another work which contains the same or similar subject matter as the Mural. Motorhead makes no warranties, representations or promises as to the amount of promotional or publicity value the Muralist may derive from painting the Mural or the amount of time during which the Mural shall be permitted to exist. In this connection, the Muralist agrees that Motorhead reserves the right at any time to remove and/or alter or modify the Mural and/or to replace it, without any obligation or liability of any kind to the Muralist. 8. The Muralist shall at his or her sole expense pay and bear all costs and liabilities related, directly or indirectly, to the Mural including, without limitation, the cost of all materials, equipment and personnel. The Muralist shall use the highest quality outdoor weather-proof paint and other materials to create the Mural. Without limiting the generality of the foregoing, the Muralist shall maintain public liability insurance, workers’ compensation insurance and personal medical, disability and life insurance. It is expressly understood and agreed that the Muralist accepts full and sole responsibility for the safety and well- being of the Muralist, the Muralists’ personnel and the public, and the Muralist indemnifies and holds Motorhead, The Rainbow Bar And Grill and the Roxy Theatre (and all of their respective owners, employees, directors, officers, shareholders, representatives, affiliates, subsidiaries, successors and assigns) harmless from and against any of the foregoing. The Muralist represents and warrants that he or she has the right to enter into this agreement and grant to Motorhead all of the rights and interests herein granted, and that the Mural is and shall be original with the Muralist and shall not infringe, violate or interfere with the rights of any person or entity; notwithstanding the foregoing, the Muralist’s aforesaid warranty shall not apply to any artwork, photographs, logos or other materials which Motorhead owns and controls and has furnished to the Muralist and specifically requested that the Muralist incorporate into the Mural. The Muralist shall indemnify, defend and hold Motorhead harmless in connection with any breach or alleged breach of this agreement or any warranty, representation, undertaking or promise made by the Muralist hereunder. The Muralist agrees to execute any and all further documents that we may deem necessary for us to enjoy the rights granted to us hereunder. This agreement constitutes the Muralist’s and Motorhead’s entire agreement and may only be modified or amended by a written instrument signed by both parties. If any provision of this agreement is held to be invalid, such decision shall not affect any other provision. No purchase is necessary to make a submission or to be considered and selected as the Muralist. Situated in the legendary rock star hang out Rainbow Bar & Grill on Sunset Strip West Hollywood, Lemmy’s Lounge was created as a tribute to our fallen hero, Lemmy Kilmister, to celebrate his legacy for the world. 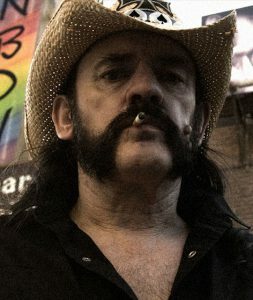 When not on the road touring or in the studio recording, Lemmy could be found at the Rainbow relaxing with a drink in one hand and the other on his favourite game machine. All are welcome at Lemmy’s Lounge raise a glass in honor of Lemmy at the Rainbow Bar & Grill. 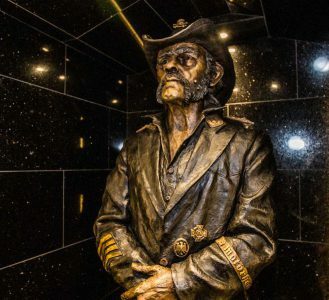 In celebration of his legacy the owners of the Roxy, Nic Adler and Paul Tollett of Goldenvoice have kindly agreed to allow the painting of a celebratory mural commemorating the life of Lemmy and Motorhead on the side wall of the Roxy, opposite Lemmy’s Lounge and statue. Motörhead’s management are seeking a local LA muralist painter that is interested in the opportunity to provide their services to paint this immortal artwork in celebration of our fallen hero’s life. Interested parties should fill the below form.